You can find valuable resources on our website's Documents page. Are you interested in learning about our lakes or how to reserve the Park Pavilion? Want to check out the Resident Directory? Maybe review 17 years of board meeting minutes? The documents page has a wealth of information for our community! Regular monthly Board of Directors meeting. The neighborhood Yard Sale is slated for Saturday, May 18th 11:00am Watch your mailboxes for flyers by the end of April. Sue Inderhees takes care of the publicity and makes maps of the neighborhood so your sale can be found easily. All you have to do is fill out the form and return it with a registration fee. The Neighborhood Independence Day Celebration will be Saturday, June 29th. 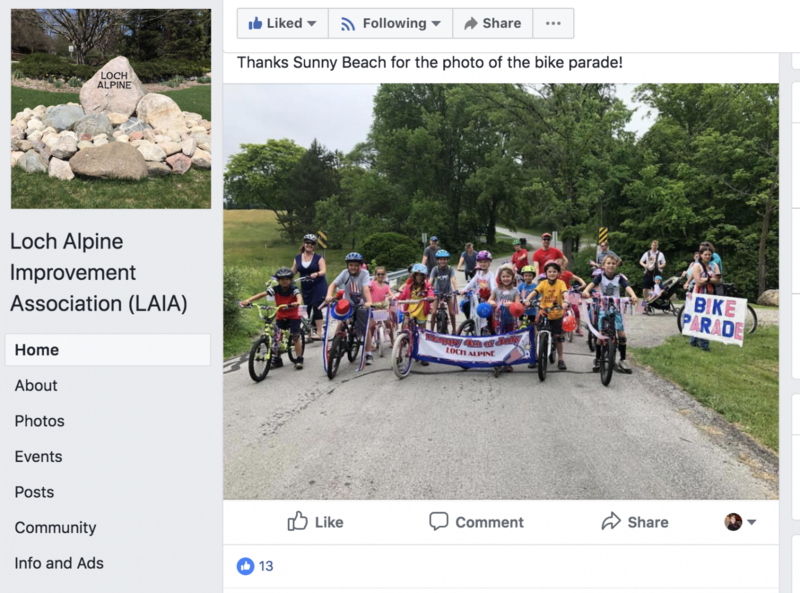 Beginning at 12:30 in “Rock Park” (off of Bridgeway) kids will have a chance to decorate their bikes/scooters/wagons, then the Bike Parade will travel down Bridgeway to Loch Alpine Park where families can enjoy fun games, crafts, and activities until 4pm. Fireworks will begin at dusk, launched from Midway. Did you update your contact information? New Additions to our Grounds: Little Free Library and 2 New Benches! Thanks to Matthew Bauersfeld and Boy Scout Troop 442, Loch Alpine has benefited from another successful Eagle Scout Project. Be sure to check out the Little Free Library in the Park and the two new cozy benches, each with a splendid view of our Lakes. The project was funded by the Sam Horowitz Trust and the new benches are inscribed in Sam’s memory. Those of us who remember Sam know he would have loved this project! The Library already has had activity, books have been added and books have been taken. We now have space for a few extra books and encourage the sharing of reading materials but only until the Library is full. Thanks again Matthew and Troop 442! 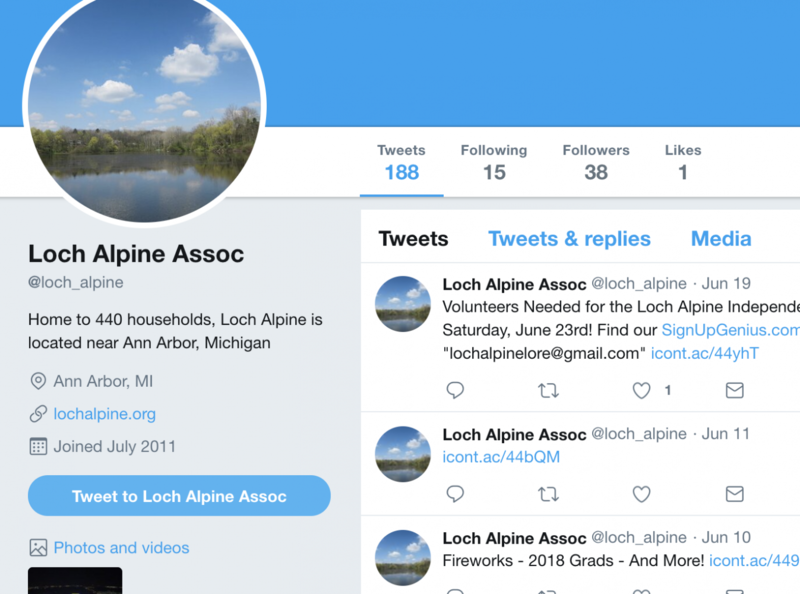 Do you follow Loch Alpine on social media? This is a great way to stay connected to your neighbors, receive board updates and important notifications, and post information. The Loch Alpine Award was established by the Loch Alpine Improvement Association to recognize a person or persons who have demonstrated Exemplary efforts, Commitment and Dedication to the Loch Alpine Community. In 2018, there were two members of the community recognized. to manage the maintenance of our entrances, grounds & parks. work, always ready to pitch-in. needed and attending Board meetings to keep the business on schedule. The Loch Alpine Improvement Association is proud to have honored recipients of the Loch Alpine Award since 2001 (prior to 2013, the award was designated the Sendra Award). The previous recipients can be found here.